It has taken me many years in life to learn the lesson 'Don't buy basic basics'. It's a false economy to purchase cheap quality basics, as they will stretch, fade or unravel quickly and off you go again hunting for replacements. Because you need to replace them quickly, you grab the first cheapo thing you see, and the cycle repeats. By 'basics" I'm talking about wardrobe staples, simple styles usually in a plain colour or unfussy pattern (stripes, dots or gingham in my book!) that are regularly worn. They help take other items across seasons, they are easy-care, easily layered, and provide a blank canvas for your chosen accessories and styling. Today I'm looking at basic tops. I personally prefer something a little fancier than a plain jersey t-shirt in my basics, as they just help an outfit feel a bit smarter overall, so you won't find any plain t-shirts or vest tops in my roundup today. Let's aim a little higher. I'll admit it's hard to find perfect basics, particularly if your tastes extend to vintage styles, because the high street only provides them when they're in fashion - I despaired when jeggings rose to popularity because suddenly tops became really long. The length worked well to cover jegging muffin top, but tops suddenly had too much fabric to tuck into high waist trousers. It also feels a bit painful spending £40 on a relatively plain top, when you've seen a fabulous novelty print skirt for the same price that makes you giddy with excitement. Basics can seem boring in comparison, but remember that they're there to make the fabulous items work - that novelty print skirt needs a plain top to go with it. Here then are some of the basics I've been eyeing to help the stars of my wardrobe shine a little brighter. For those sunny days, you can't beat a pretty little sleeveless top. Plainish ones also work much better for travelling, when you have a limited wardrobe capacity and need to mix and match items. Top row: Twist sun top in coral from Vivien of Holloway, £28, lots of other colours. Dolly pink gingham top from Tara Starlet, £45, also in yellow. Lowri mustard plain bow top from Collectif, also in black. 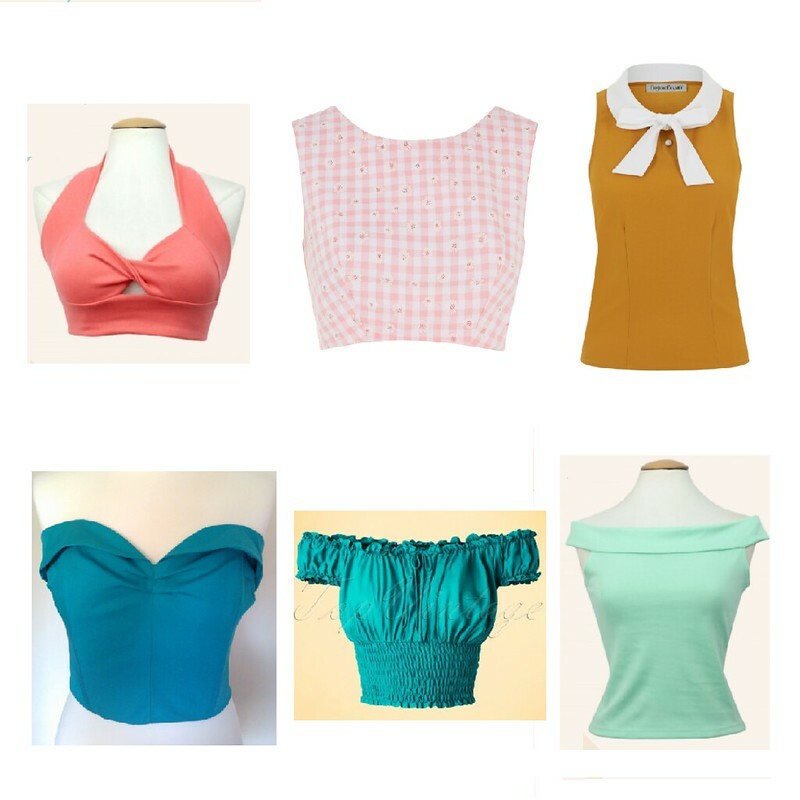 Bottom row: Classic suntop in teal by Piplotex, £55, also in hot pink. Bettie Page Fiesta top in Jade from Top Vintage, £40.19, in red and black also. Mint Bardot sun top from Vivien of Holloway, £28, also available in many other colours. When you need to cover up a little bit more, perhaps for work, then some short sleeve tops are required. Top row: Ivory Bonnie sailor blouse from Seamstress of Bloomsbury, £39, also available in red and navy. Mustard Bobby Jumper from Miss Fortune, £35.99, available in blue also. Red wrap top from House of Foxy, £52, also available in navy. 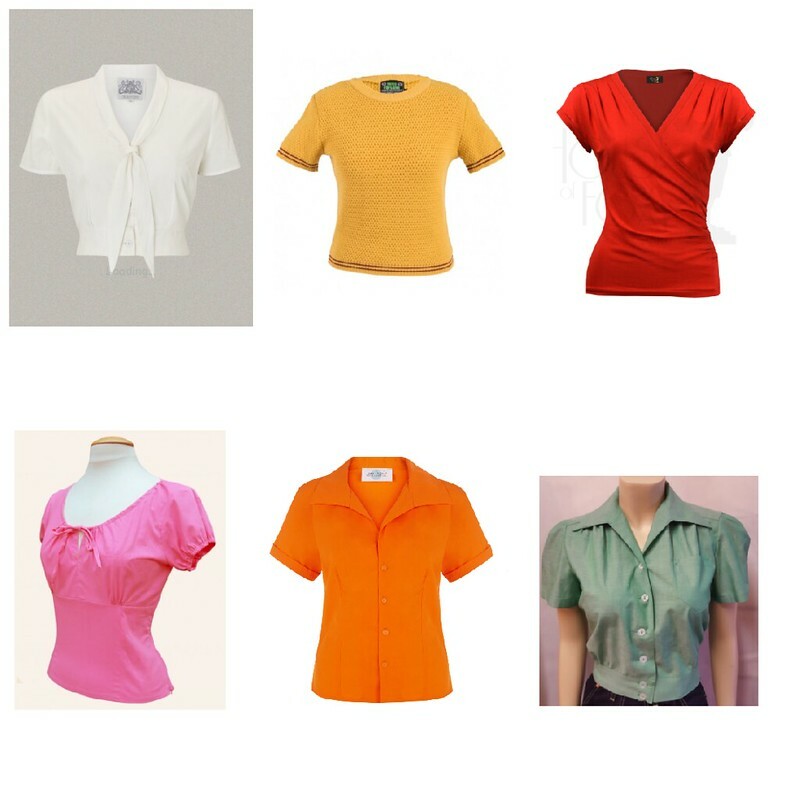 Bottom row: Cerise Rio top from Vivien of Holloway, £35, loads of colours. Orange Joanne shirt from Tara Starlet, £54, also in white and yellow. Green Work Blouse from Freddies of Pinewood, £35, also available in many other colours. Where do you buy your 'basics'? Do you splurge or just replace more often? I must say that I wear more dresses than separates. It is generally easier as I try to sew as many of my clothes as possible. That being said I have a lovely white crop top that has been worn so much last year because it went with just about everything I wear. Totally need more basic tops to go with my printed skirts!!! Some really cute items here, I think I need to start pitching more at quality rather then quantity. Seriously though, this is a delightful roundup of classic, fun filled styles that likes of which I think most of us (vintage gals) would gleefully add to our closets. Thank you for sharing these beauties with us. My wishlist was expanded by this lovely post. I'm the worst about that kind of thing, often because I'm inevitably a bit short on cash when I realize I don't have anything as basic as a plain white t-shirt, and then I end up running into forever21 and buying a really terrible quality one for about $8. What I really need in my life is something like that Seamstress of Bloomsbury top, which is cute AF and would go with everything in the world. Now these are my kind of basics! These are not boring at all! I absolutely adore that mustard sleeveless top with the bow! For items that I know that I am going to be wearing them lots I will definitely spend more money on them but trendy items I may just spend a little. Weirdly for someone with such boring style, I haven't bought basics (footwear aside) in a long time. Though I suppose 'basics' is relative. My fancy is probably everyone else's basics. I like the mustard sleeveless top and orange shortsleeved blouse that you've found.